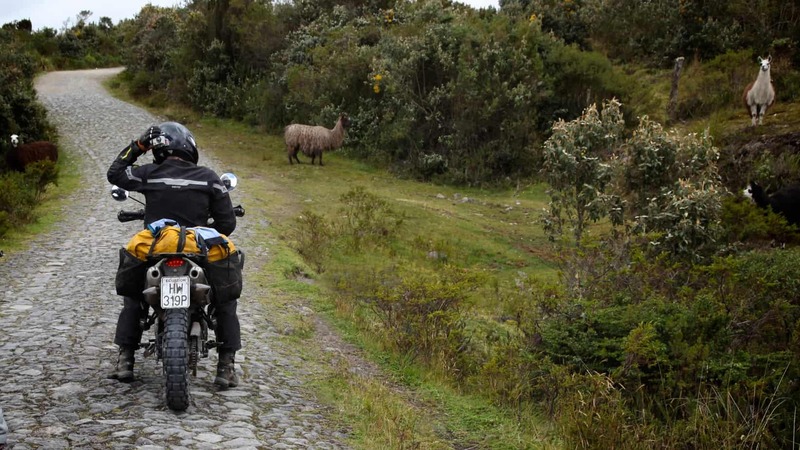 You’ve probably seen him before, that guy on the $20,000 adventure bike wearing jeans, hiking boots, and a jacket best suited for riding a bar stool. 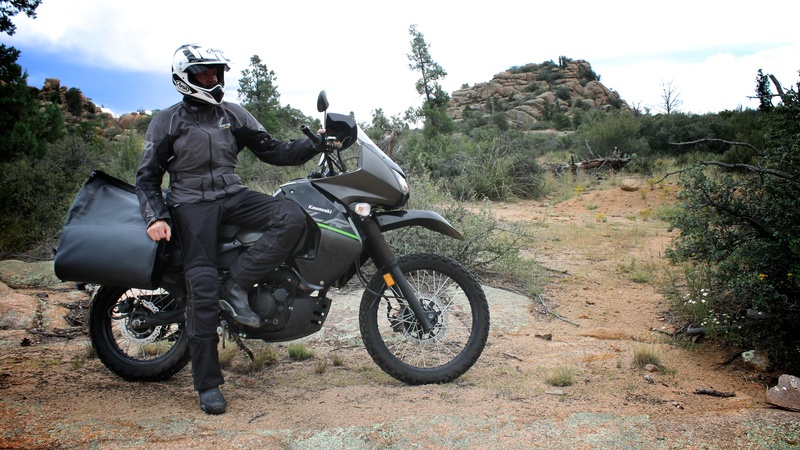 With so many choices for jackets and pants, there is no reason to ride in anything but the appropriate gear. The trick is knowing which gear to buy. The most important protective element of any suit is the material used in its construction. This is where a sea of buzzwords come into play like Armacor, Talisman, Cordura AFT, and GoreTex Pro, just to name a few. These fabrics are largely what drive the retail price. Talisman is a GoreTex fabric printed with tiny ceramic dots to help provide the fabric with better sliding attributes. Sliding is far better than tumbling in the event of a crash. GoreTex Pro combines unrivaled waterproofness with maximum breathability for the ultimate in foul weather protection. Cordura AFT is a particularly durable material that still has excellent air pass-through rivaling that of open mesh. Then there are materials like soft Pittard leather, Karvin cowhide, Coolmax, and blends of polyamide, polyester, nylon, and many others. Understanding these fabrics is an important aspect of suit selection. Coming off a motorcycle at any speed obviously puts your delicate joints at risk of injury. Your elbows, knees, hips, and shoulders are the body parts most prone to damage in a crash, so padding them is of paramount importance. All body armor is not created equally. CE-certified armor has been tested and graded by a European organization composed of industry and medical experts. They take into account how much coverage a pad offers, as well as how much energy it absorbs on impact. They offer a range of ratings to designate the level of protection afforded by any given pad. 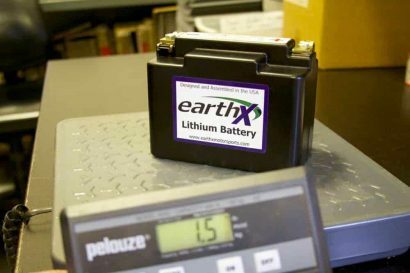 CE-approved armor with a level 2 rating exceeds that of level 1. Type B pads are larger than type A. Get to know the ratings for armor and buy a suit appropriate to your needs. There are a number of different types of protective pads made from different materials. Some advanced foams and rubbers are temperature sensitive. Putting on a cold suit in the morning can be unpleasant if your pads have become misshapen and stiffened like concrete overnight. Conversely, some pads when exposed to body heat get increasingly flexible allowing for more freedom of movement. There are also advanced materials that are soft to the touch, but harden on impact. It’s important to note that many suits do not come with hip, chest, or back protectors. These are vital areas that need to be protected. Hip injuries are excruciatingly painful, ask me how I know. 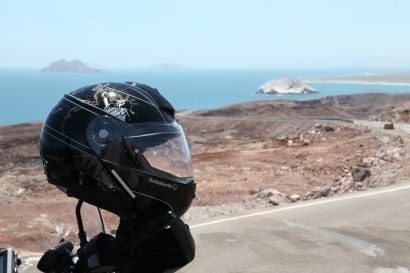 Chest impacts result in the most common and serious motorcycle injuries, and we needn’t explain the importance of protecting your back. Within the scope of safety, visibility is essential. The most frequent accident is the SMIDSY or, “Sorry Mate I Didn’t See You.” Black is appropriate for Johnny Cash, but when you’re rolling into a busy intersection in low light, being dressed like a shadow is ill-advised. If you choose to wear all black because it looks cool, just know you have made a conscious choice to place aesthetics well above the very real threat of getting crunched by a Buick. 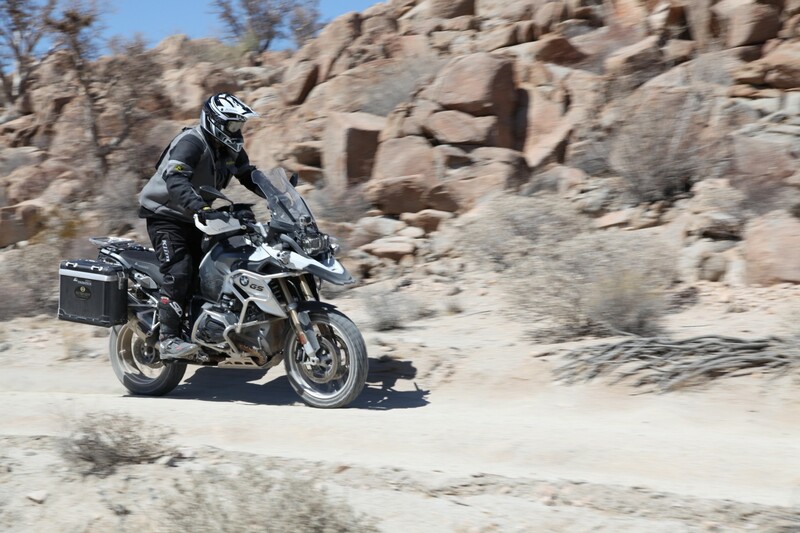 Spend any time riding in extremes of weather and you will understand just how important good suit design really is. Whether riding in triple digit heat or through a rainstorm, the elements are unkind to those not prepared for them. There are but a handful of suits that can claim to be as effective in the heat of July as they are in the wet of winter. For summer use in scorching heat, nothing will beat the comfort of a mesh suit. Products like the REV’IT! 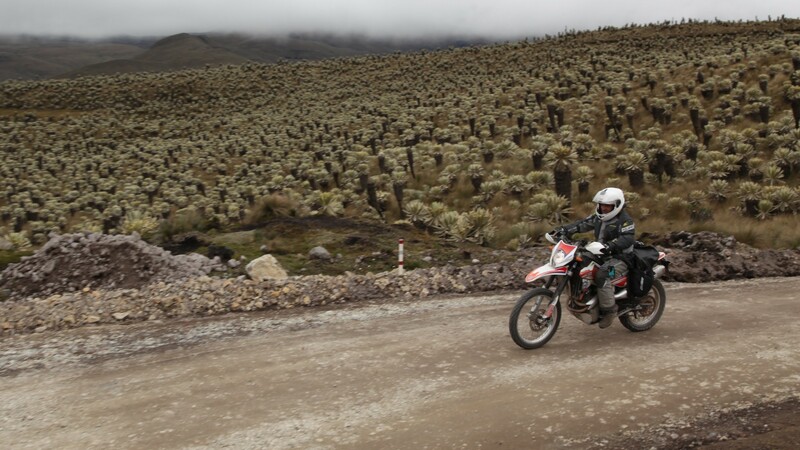 Levante, Klim Rally, or Rukka Airman offer respite from the heat with full-body air conditioning. Almost all suits have some vents, but nothing creates a rush of cooling air like full mesh. 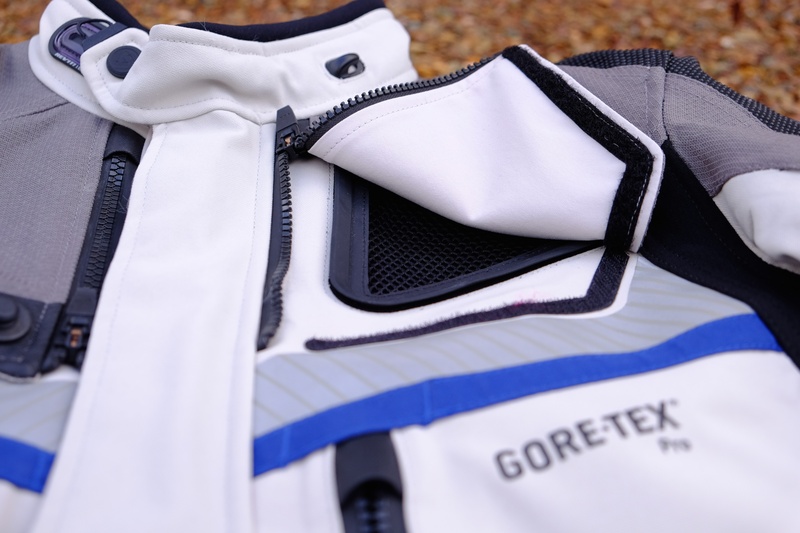 The ultimate in weather protection is afforded by suits made of GoreTex Pro. These suits fetch staggering prices, but have no equal when the weather turns. Because GoreTex fabric is 100% waterproof, it must be paired to expensive waterproof zippers and other technologies like REV’IT!’s unique rubber rain gutter seals which rim their mesh panel vents. Adding to the cost of a GoreTex suit is the necessity to seal every single seam with waterproof/breathable tape. 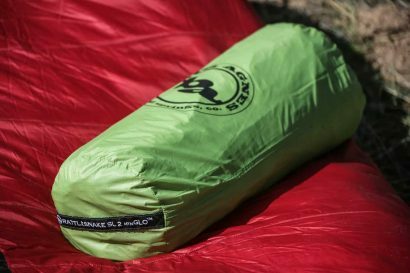 The most common way to attack weatherproofness is with the use of a waterproof inner liner. I liken this to having waterproof underwear. 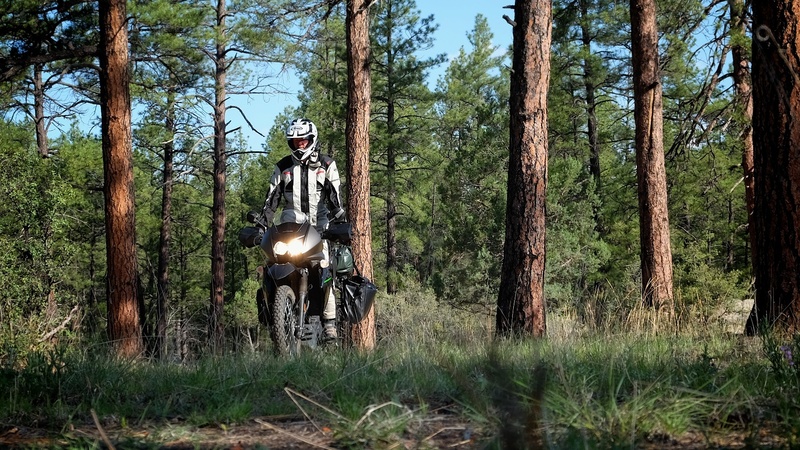 The rider typically stays dry enough when riding in foul weather, but the outer suit gets utterly drenched. Once that outer layer becomes saturated, it conspires to reduce the breathability of the inner liner. Before long, condensation builds and the rider is wet from within. This begs the question: why in the world do manufacturers still use waterproof liners? The answer is: Money. It’s far easier to tape the few seams of a liner than it is the complex web of seams on the outer shell. It also requires less of the waterproof fabric, which tends to be rather expensive. The removal of the liner also greatly improves the ability to ventilate the jacket in warmer temperatures. Although the liner system seems like an inferior design, it is all the same the most commonly used. If you find yourself regularly riding in the rain, a waterproof outer shell is the way to go. Any suit designed to shut out the elements will require thoughtful ventilation features lest the rider bake like a ham. There are various types of vents used by manufacturers to not only import air into a suit, but to expel hot air in equal volume. Some vents are little more than zippered slits placed at optimal locations on the suit. These vents seldom work as advertised. The challenge with vent slits is that they often don’t open far enough to move much air. Direct vent panels offer far more effective air pass-through by creating more vented surface area. The placement of the vents is also a critical design feature. Vents have to be able to gather air and move it about the interior of the suit. They then need to be able to purge warm air. Some suits place the vents in areas shielded by the motorcycle tank or windshield reducing their effectiveness. Vents on the inner thigh for example, don’t gather as much air as vents on the outer thigh. Another woe of some suits is a lack of ventilation along the lower leg or arms. It is important for any suit to produce a steady flow of cooling air to the entire body, top and bottom. Further complicating the placement of vents is their effect on the safety of the suit. Vents must be placed at points on the body that are less likely to suffer impact in a crash. Having a big gaping vent on your outer thigh won’t be fun when sliding across the tarmac. There is a fine line between too many features and too few, and some are more useful than others. With regard to pockets and storage elements, many things play into their effectiveness. Pockets have to be easily accessed and large enough to be useful. Depending on where they are placed on the suit, it is important if they are waterproof and secured with reliable and easy to operate closures. The HELD Caresse II jacket is a great example with the inner portion of the jacket festooned with security pockets, some of which are discretely hidden from sight. 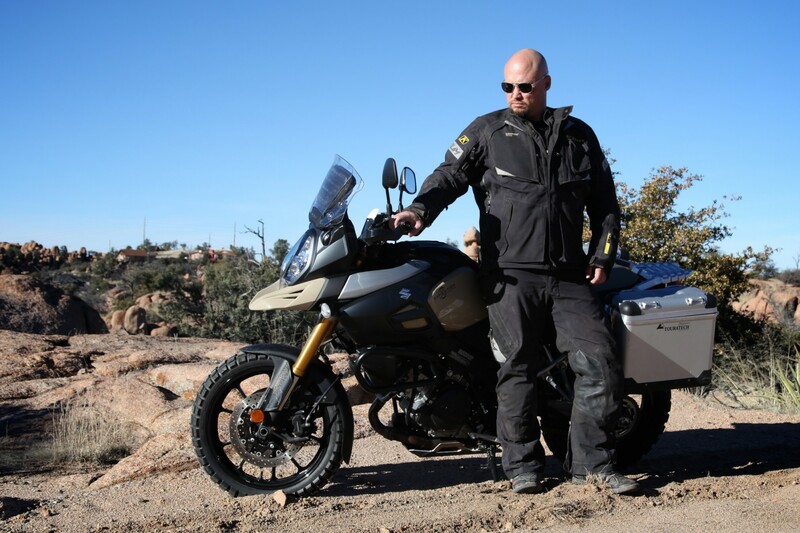 The Klim Badlands has a number of pockets on the front of the jacket, all easily accessed, even while riding. There is a great deal of personal preference folded into the placement of pockets and other features. Some pants have pockets that are so poorly placed that they conspire to dump their contents as soon as the rider assumes a seated position. Other pants have no pockets at all, or if they do, they’re so small as to be impractical. For many adventure riders, the suit they wear is another piece of luggage, so storage features rank high in the suit’s utility. Additional features often include conveniences like internal pouches for a hydration reservoir or attachment points for neck braces. The Rukka Airman jacket has a waterproof pouch connected to the left front pocket with a nylon lanyard, a nice touch adding to the security of important items. 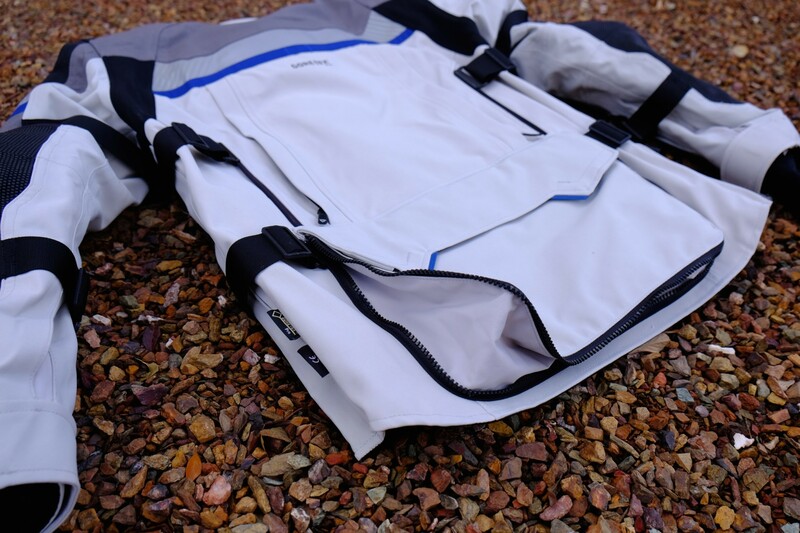 The Spidi Ergo 365 Expedition jacket has a rear back pocket that doubles as a tank bag in a pinch. All of REV’IT!’s jackets can be paired to their Challenger Cooling Vest for use in warm weather. Good features, not gimmicky add-ons, can make a good suit even better. To improve fit, some companies will offer their jackets and pants in an extensive range of sizes. Others, in an effort to trim costs, will provide the minimum range in XS through XL sizes with no options for inseam variations in pants. Buying a slightly more expensive suit may afford more available sizes and a better fit. Suit comfort is complicated, but the most understated aspect can be attributed to overall ergonomics. Bodies are three dimensional and have very dynamic movements. Good suit designers will place articulated seams at key points to improve mobility. Stretch panels and gussets placed at the elbows, knees, and across the shoulders prevent pressure and chafe points. Adjustment straps at the arms, lower rib cage, and lower legs eliminate the flagging of excess material which can also be an irritant. One of the most critical aspects of comfort is the use of soft-touch materials at points where the suit contacts bare skin. The collar, sleeve cuffs, and waistband are places where soft, moisture-wicking materials are worth the extra price. I once retired a beautiful suit, one I loved dearly, only because the collar was so rough it would rub my skin raw after just a few short hours.